Sometimes you get much needed help and sometimes you do not. The out-of-town scoreboard can be a very good friend or a very distant foe. 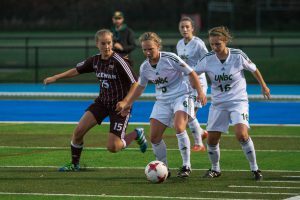 Heading into the last week of the Canada West soccer regular season it appeared the UNBC Timberwolves would qualify for the men’s playoffs, but would miss the women’s post-season dance. As it turned out, it was just the opposite. The UNBC women qualified while the men were stunned to find out they were left out of the picture. Let’s start with the women, where the top six out of eight teams in the Pacific Division would advance to the playoffs. With two games remaining, UNBC was last with a 1-8-3 record, but they still had a chance despite not controlling its own destiny. The Lady Timberwolves needed to win their final two home games, which they did, 2-0 over TRU (October 19th) and 1-0 over UBC-Okanagan (October 21st). If UNBC was to sneak into that last spot, they had to rely on its buddy, the out-of-town scoreboard, which in this case was the MacEwan Griffins. The Timberwolves needed MacEwan to beat UBC-O on the Friday (which they did 4-1), and either tie or beat TRU on Sunday (a game that ended 1-1). The UNBC women had the results go their way and were obviously jubilant about advancing and the valuable playoff experience that comes with it. UNBC plays 6-5-3 Manitoba tonight (Friday) at UBC in a play-in game, with the winner to advance to Sunday’s quarter-final, also at UBC, against the second place Thunderbirds. Whether they win or not this weekend, the Timberwolves will remember the euphoria of finishing their regular season on a dramatic high. The same, however, can not be said for the UNBC men. In fact, some of their players may still be dumbfounded that they will be watching the playoffs from the sidelines. The UNBC men were 5-3-5 and in third place in the Pacific Division. All they needed to earn the fourth and final post-season berth was to win one of their last two games at Fraser Valley or have Thompson Rivers University (TRU) Wolfpack of Kamloops lose or tie one of their final three games. The unthinkable happened and in stunning fashion. TRU was just 3-6-3 in the standings before they beat Trinity Western University 2-1 on October 17th, a re-scheduled game from August 26th. Trinity was the second place team. On October 19th, the UNBC men dropped to fourth place after a 1-0 at Fraser Valley, however, they still were the odds-on favorite to secure the fourth and final berth in the seven-team Pacific Division. On October 20th in the afternoon, TRU stayed alive with a 4-1 victory over the visiting Victoria Vikes. The Timberwolves on the evening of October 20th, needed a win at Fraser Valley to finally nail down a berth. UNBC led 2-1 late in the game but gave up a goal in injury time (one has to be kidding) after the T-Wolves were whistled for a hand ball in the box. The Timberwolves were less than two minutes away from reaching their objective, but the 2-2 draw meant UNBC would have to wait another day, which would determine their fate. On Sunday, October 21st, the Timberwolves playoff hopes were now in the hands of the first place and unbeaten UBC Thunderbirds. That is correct, the 13-0-2 Thunderbirds had not lost all year. Sure UBC was going to play some of its back-up players, but they also had an impressive streak to preserve. All UNBC needed was a tie or UBC victory against TRU but, of course, The Wolfpack scored a 1-0 victory in Kamloops which officially knocked the Timberwolves out of the post-season equation. TRU finished 6-6-3 while UNBC was 5-4-6 (best record in team history), yet the tiebreaker went to the Wolfpack. Ironically, last year the 5-5-6 UNBC men made the playoffs on the last weekend only because Victoria lost its last game 4-2 to Trinity Western. Had Victoria won that game UNBC would have been out as the Timberwolves had the bye on the final weekend. The moral of the story, and it is a common theme in sports, control your own destiny and don’t put your fate into another team’s hands. Sometimes it works out, as it did for the 2018 UNBC women’s soccer team, but other times it can be a painful process when it doesn’t go your way like it did for the UNBC men. The out-of-town scoreboard has no feelings, no passion, no emotion, no sympathy. To receive a favor is strictly a bonus, and should not be taken for granted, no matter what the odds may suggest. 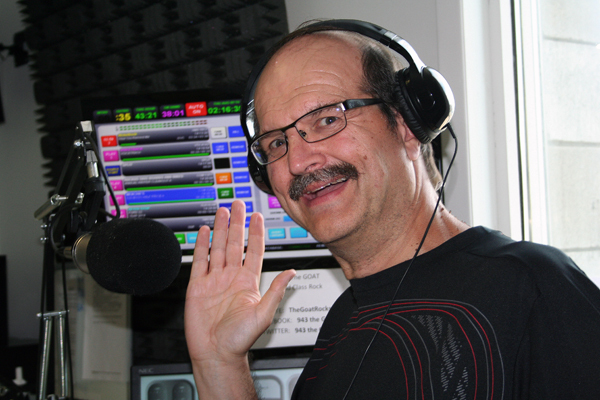 The podcast, introduced last month, predominately features the Prince George Cougars. My guest this week is Cougars minority owner and long-time NHL player Eric Brewer. LaVar Ball’s company has come out with a cheaper Lonzo Ball signature shoe that sells for $200, down from the original $495. They were going to be called “Air Lonzo” but didn’t want it to be confused with his jump shot. A postal worker in New Orleans reportedly stole $630,000 of stamps to fund his gambling habit. Prosecutors say they’ll have no problem making the charges stick. Marijuana is now legal in Canada. And, for a lot of professional football players, the CFL just got more appealing. Lee has requested six Buffalo Bills players as pallbearers so they can let him down one last time. Word out of Ottawa is the Redblacks’ lumberjack mascot accidently sat on a chainsaw. He’s okay, but got behind in his work.